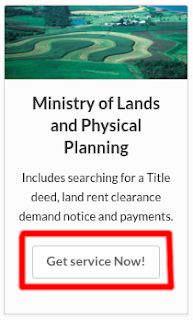 It is now possible to a land search online. This is after the Ministry of Lands and Physical Planning came live on eCitizen.go.ke, the government's online services portal. Log in or create an account if you don't have one. Scroll down and look for Ministry of Lands and Physical Planning. Click the "Get Service Button" as shown in the image below. Next, click "Make Application" then select Lands Search -> Official Lands Search and follow the instructions. Fill in the application form with the correct land Title Number and parcel number from the online registry. Make the online payment of Kes 550. Click on the download button to access the print the results from the Land Search.